Thank you all for your patience while my website fought off some technical difficulties. We changed Domain registration providers and there were some snafu's in the transfer. I appreciate you all sticking with me as we endured to get through and here we are! While we were down, something AMAZING happened...the 2015-16 Annual Catalog was released and I have to tell you, I LOVE it!!! There are some seriously fabulous new products this year and I couldn't wait to get my hands on them. Stay tuned over the next few weeks for posts highlighting some of my favourites. I may be a month behind; but, I promise I'll get you all caught up! If you're like me, you'll want to have one of these puppies in your hot little hands to thumb through, page by page, time and time again. If you haven't already received your copy and you'd like one; simply send me an email with your name and address and I'll get one to you ASAP. If you like to browse online, you'll want to bookmark my online store and catalog. 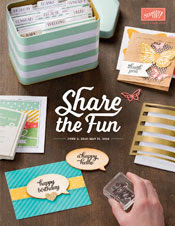 Don't miss out on my Tin of Cards class coming up later this month. Visit my events page for more details.